We are thrilled to announce that the Northampton Community Arts Trust has received a $180,000 capital grant from the Massachusetts Executive Office for Administration and Finance, under the 'Promoting Community Development and Tourism in Central and Western Massachusetts' grant program. We will direct the funds to our Energy Efficiency Project, just part of the renovation plan for 33 Hawley. 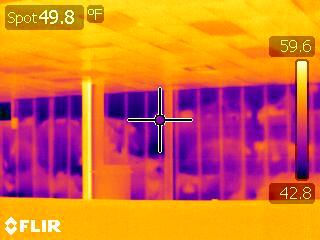 That oddball image above is a thermal snapshot of the interior walls of Hawley Street back in February. As you can see, the walls were pretty chilly in spots, around 43°. We plan to invest in enormous improvements to the building's energy efficiency by completely insulating the exterior walls and roof, replacing doors and windows and upgrading or replacing the HVAC system. Driving the operational and maintenance costs of the building as low as possible is a key to our ability to deliver an affordable and sustainable space for creative work in Northampton. We're fortunate to be working with a local architect, Tom Douglas, and energy consultant Adin Maynard, who share our aims and intentions, and have helped us understand our options. While we continue our design work and energy modeling, we will also focus on further grant opportunities as part of a capital campaign, which itself is in the planning stages. This is a great award for us, but it certainly won't be our last. Meantime, keep in mind that we have a production in the building this week and weekend -- 'Skyscraper' by David Auburn, directed by Chris Rohmann. Details over on the 'Happenings' page. Join the The School for Contemporary Dance and Thought (S.C.D.T.) and the Arts Trust for POP Northampton! - a community-building, performance-based celebration of the new dance school and new downtown Northampton arts space on Thursday May 29 from 5:00 to 9:00pm at 33 Hawley. Well, that was some winter. Now that Spring has rolled around and the flowers are blooming, it's time for 33 Hawley Street to blossom a bit. We kept most of the building mothballed over the winter, but warmer temperatures will allow us to open up more areas of the building to special events during the Spring and Summer.